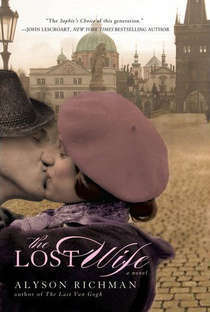 The Lost Wife is a powerful read. I was drawn to it for the love story, but I received so much more from it. I literally got chills as I read the opening chapter where Josef recognizes Lenka, whom he hasn’t seen in sixty years. In the second chapter you are transported back in time to pre-war Prague where we get to experience this couples love grow and their lives change forever as they anticipate the war with Germany. The story is told from each of their perspectives which I loved. You get a few chapters from Lenka and then a few from Josef. I will admit going into this I mostly knew about the famous concentration camps like Auschwitz, but I had never heard of Terezĺn where Lenka and her family are sent. It was fascinating to learn about this ghetto city and at the same time heart-wrenching as the family struggles to survive. Richman obviously did a lot of research and it shows. Both Lenka and Josef are likable characters. You want them to end up together and yet, right from the beginning, you know they don’t. I don’t want to get into any spoilers, but I really liked that there was a reason that the two didn’t reconnect after the war. It’s so sad, but it makes it understandable. My favorite part was actually reading the Author’s Note at the very end of the book. In the note Richman talks about the real life stories that inspired the book along with all of the characters that actually existed. These people were amazing, brave, and so strong. I loved finding out that a particular brave character, Bedřich Fritta, was a real person who actually did what was written in the book. They are all true inspirations. I would recommend this story to anyone, though I know some people won’t be able to read it. My mother is one who can’t handle books about things that were so awful that really happened, like the Holocaust. She wants to be able to say it’s just a story, and when she can’t it’s too much for her heart to take. But if you don’t mind shedding some tears, this is a must read. Sounds like a fabulous book to read, I always enjoy a good love story! Adding to my Goodreads list!